While 31 isn’t as cool as 30 and, yes, I am one year older, I still LOVE my birthday. I don’t let my age stress me out and make me anxious. I embarrass it and feel super blessed that I’m happy and healthy. I’m able to chase my babies around while chasing my dreams and stealing kisses from my husband any chance I get. Birthday’s are all about celebrating this one life I have been given and reflecting on all the amazing things I’ve accomplished. When people ask me today how old I am, I’m going to answer them with a big smile on my face and joy in my heart. Birthday’s are made for celebrating and eating all the confetti cake and ice cream! Today, more than any day of the year, I want to embrace who I am and laugh at some of my quirky traits. So in no particular order here are 31 things about me on my 31st birthday! Me on my first birthday! 1. I have a huge crush on Josh Turner. I have seen him in concert a few times and his song “I Wouldn’t Be A Man” was the song J.D. and I danced to at our wedding. 2. J.D. and I met a few weeks after I graduated high school. I was only 17 and we have been together ever since. 3. I wish I had a southern accent. 4. Most of the time I’m an all or nothing kind of girl. Makeup; full face or nothing at all. My car; totally spotless or a complete disaster. My to-do list; I knock it out of the park or do nothing at all. 6. Koala Bears are my favorite animal. 7. Billy Ray Cyrus was the first concert I ever saw. His song “Achy Breaky Heart” was my jam! 8. I’m not a fan of the winter, which is ironic considering I live in Montana. 9. The Big Bang Theory is my favorite show and I completely geek out about it. 10. We’re huge Patriots fans, J.D. has been a fan since elementary school. When we first started dating I could’ve cared less about football. Read: I was only in it for the food and beer! Now I LOVE football and completely understand what all the fuss is about. I’m hoping to surprise J.D. with a trip to New England for his birthday next year! 11. I’m not a fan of chocolate, unless it’s brownies and then I will eat the whole pan. 12. I love staying in hotels. 13. When I was little I wanted a retainer and glasses so bad. Lucky me, I got both. 15. When I was little I wanted to be an interior designer and architect. I would draw house plans and how each room would be decorated. There was one layout I loved so much and to this day I can still envision it. I’m still passionate about interior design and get all giddy when I get asked to help decorate someone’s house. 16. I’m a creative soul by nature. I love to decorate, build things, watercolor, craft, color with my boys, design weddings. Basically any crafty thing and I’m all about it! 17. I may love to decorate and be crafty, but one thing I’m terrible at is baking. Oh how I wish I could bake some amazing treats for my family. I would love to make Christmas cookie platters with more than just sugar cookies. I’m getting better, I will give myself that, but my level of expertise doesn’t go further than brownies, cake mix, banana bread and sugar cookies. 18. Another thing I’m not the best at is gardening. My husband has a green thumb and has taught me a lot, but if it wasn’t for him our garden would be nonexistent. I so desperately want to have a yard and patio full of flowers. Every spring I tell myself, “This is the year you won’t kill anything!” Every year I’m wrong and I have to buy more flowers mid summer. 19. Ever since having kids I get really car sick. If I’m driving I’m fine, but if J.D. is driving and I turn around to give the boys something I’m instantly nauseous. Gone are the days of reading while on road trips. 20. For my 30th birthday my best friend and I went to New York and met Hoda Kotb! 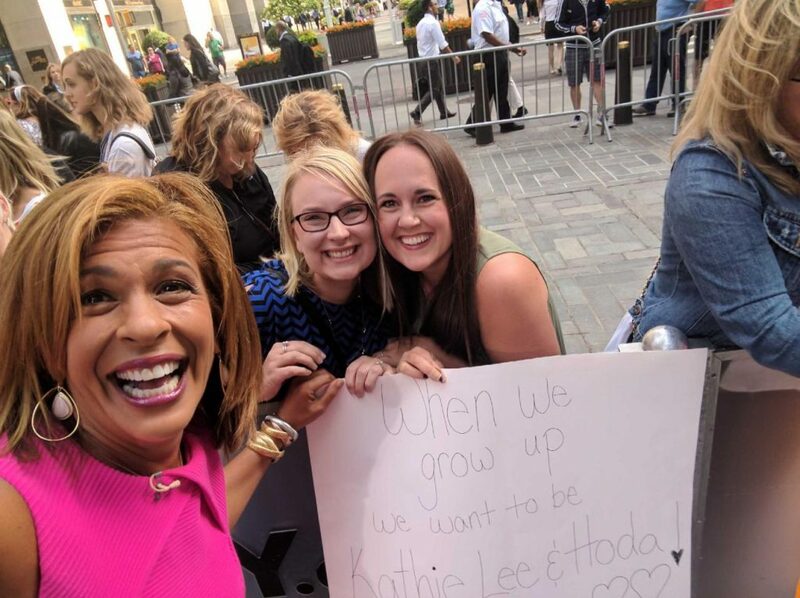 We are huge Kathie Lee and Hoda fans and we may have completely flipped out when we met her! Our sign said “When we grow up we want to be Kathie Lee and Hoda!” Haha! 21. I’m an only child. 22. I love my boys with all my heart and dream about adopting a little girl in the very near future. 23. In high school I was an avid runner. I’m so mad at myself for ever stopping. 24. I start every morning with a hot, hot cup of coffee (I even warm up my cup, before I make coffee, so it stays extra hot), and in the afternoon I crave iced coffee with extra ice. 25. I have never sung karaoke, nor do I ever plan to. 26. I’m deathly afraid of mice. Just the thought of them give me the creeps. 27. My first kiss was when I was in kindergarten. My best friend and I were playing on the playground when he ran up, kissed me and ran away. 28. I’m a total morning person and have to have time to myself every morning or my day is shot. I love the quiet and stillness while I drink my coffee and gear up for the day. 29. I absolutely love holidays and every one that rolls around I declare “This is my favorite holiday!” Decorating and making the whole month super festive is my favorite! 30. I love being hot when I sleep. I have to have the blankets up to my face or I can’t fall asleep. 31. I can’t nap. Once I’m awake I’m up for the day. No matter how hard I try, I just lay there and think about all the things I could be doing. Happy Thursday! I hope you have a wonderful day!